Today we have a fantastic giveaway sponsored by Shabby Apple. Shabby Apple carries feminine dresses, shoes, separates and accessories with a sophisticated, vintage style. Their garments are well known for being versatile enough to wear to work or in the evening. This summer, Shabby Apple has an exquisite swimwear collection featuring many 1920's-1950's fashion inspirations. Please Note, this giveaway is closed and the winner has been announced. Thank you for entering! One lucky winner will receive a $50 gift certificate to Shabby Apple.This giveaway is open to US residents only. 2. Leave me a comment below with a link to your favorite Shabby Apple item. Please note that anonymous entrants will be disqualified. I have no way of checking your entry and contacting the winner if you don't have a name. Follow and leave entrants will be disqualified from future giveaways. Thank You for This nice Giveaway!!! I love the Racquet Club dress--although it doesn't come in my size. It seems like they are phasing out their plus size selection with the new numbered sizes? I really hope not, their dresses are adorable. My favorite item is the Dream Girl Earrings for sure. They have such cute things! Oh and I follow Shabby Apple on facebook and I LOVE that Marachino red swimsuit!!! I haven't had a one-piece in forever and this would be sooo cute!!! Wow I'm in love with the Admiral dress! I adore these oxfords. I've fallen in love with a similar pair Vixen Vintage had, but not the color. These are perfect and I also need a pair of grey shoes!! I follow you via gfc - I'm annejk112233. I'm a follower! And I like Shabby on FB. My fav item are the petals wedges. So cute! This red and white Sweet Spot swim suit has to be my favorite http://www.shabbyapple.com/p-1587-sweet-spot.aspx it is simply divine! I love how the sash accentuates the waist making for a beautiful hour glass shape! I can imagine this being worn on a Hollywood bombshell in a pool scene from a 1950's movie. Pure elegance right there! I didn't even look at the shoes. I couldn't bare to. I've followed your blog and liked them on twitter. I love the purple Tea Time dress! Gorgeous! I love the admiral navy dress! I'm a sucker for a good sailor dress and HOLY FRIJOLES that one is cute. I follow your blog and like Shabby Apple on Facebook. One of my favorites is the I'm Late! I'm Late! dress. I absolutely adore the L’or Belle # 11 (https://www.shabbyapple.com/p-1098-lor-belle-11.aspx). So elegant. I'm loving the Tilly Mary Jane! Green is my favorite color and these look comfie! The Finley Swim Top is adorable. Already "liked" on Facebook months ago...and I'm already a follower. Thanks for the giveaway! Oh, I love the dress -- the aqua and white polka dotted one! I went over to fb and liked them too! I love the color and skirt of this dress. 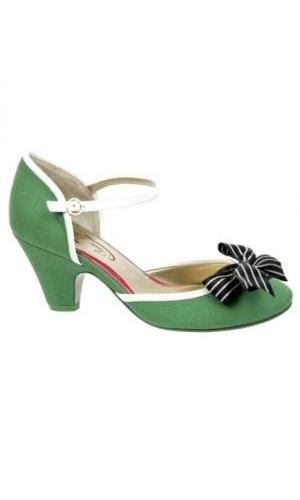 I have the perfect vintage shoes to wear with it, plus I need a new dress for my cousin's wedding! It's so bright and flirty fun! I particularly love the "1943" collection, especially this lovely wine colored dress! I am a follower of both your blog and their facebook account and my favorite item they have is probably a tie between http://www.shabbyapple.com/p-89-lete.aspx and http://www.shabbyapple.com/p-504-jitterbug.aspx. But I have a mild obsession with wrap dresses and LBD. pout pout no fair I live in Canada. Never mind cool I'm loving the green frock. Took me ages to choose but I couldn't help but love the lime dress One for my Baby that you've already pictured in your post..
Oh! How difficult to pick one favorite! I love them all! My favorite so far is: http://www.shabbyapple.com/p-1185-po-night-lapis-pp.aspx Love!!!! I love the yellow Twin Palms dress. It's so bright and cheery! I follow your blog and also "liked" Shabby Apple on facebook. Thanks for a fun giveaway! LOVE LOVE LOVE your blog Brittany! It's the color that makes this one stand out--I've wanted something in this shade ever since I saw the cute cardigan you knitted! I follow your blog (privately) on GFC and my fav dress is the I'm Late! I'm Late! Dress. Hi Brittany! Thank you for hosting this Shabby Apple Giveaway!! I follow you on GFC and like Shabby Apple on FB. I love the Pina Colada dress! So cute!! I follow you on GFC and like Shabby Apple on FB. My favorite item is Picnic ready pumps! I follow you and like Shabby Apple on FB! I love the "look of love" dress! My favorite piece is the Astra swimsuit. Fabulous! I adore the G. Cooper dress by 1943. I just wish it were available in a medium! I love the Panorama Red blouse, though I would sport it with victory rolls! My favorite dress: I'm late I'm late! I've been wanting to try Shabby Apple for a long time. They always have such cute dresses. Right now the Twin Palms dress really has my eye: http://www.shabbyapple.com/p-1528-twin-palms.aspx. (And I enjoy following your blog and have liked Shabby Apple on facebook). Thanks for the giveaway. What a fabulous site! How did I not know about this before? So hard to pick, but my favorite item (at the moment!) is probably the striped Venzia swimsuit (http://www.shabbyapple.com/p-985-venezia.aspx). Wow what a fantastic array of items....also found it hard to narrow down to one but here it is http://www.shabbyapple.com/p-926-pina-colada.aspx# - gorgeous sunny yellow pina colada dress (shame its not in my size anymore :-( ). Absolutely love everything in the Academia range....visa card here I come!! Then there's this fascinator http://www.shabbyapple.com/p-1462-french-vanilla-fascinator.aspx that I really want. I've never worn one but have always wanted to try. There are about 20 other items from Shabby Apple that I'd love to buy. Alas, my growing boys require food. But a girl can dream, can't she. Thanks for the great blog, Brittany. I follow you on gfc and like Shabby Apple on fb! Love all of their swimline but my heart is on the lighthouse dress! Thanks!